The following are brief VHD news clippings from Popular Science. Comments follow at the bottom of the page. Victor Company of Japan (JVC here) has unveiled a prototype disc system that plays video or super-fidelity audio and has computer-based, pushbutton access to pictures or sound. JVC developed the VHS video-cassette tape format, and hopes its VHD/AHD (high-density video and audio) disc system will be selected by a 29-company council now attempting to standardize a format for new pulse-code-modulation (PCM) audio discs. Several prototypes of PCM audio record players have been shown. 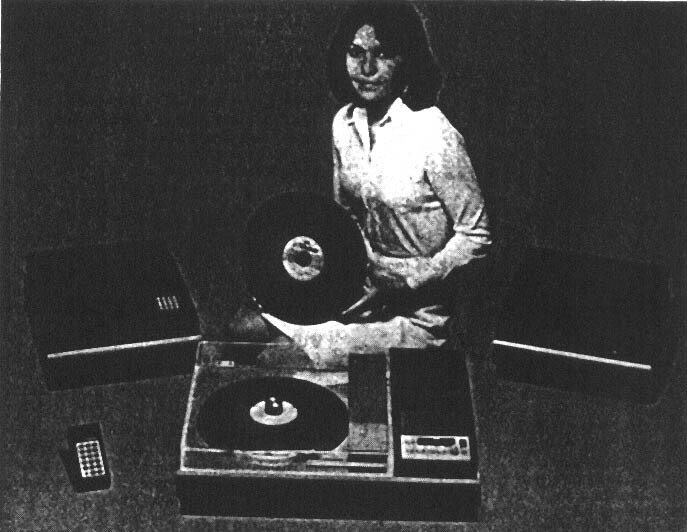 PCM systems (PS, March '78) encode music as digital signals for greatly enhanced fidelity. JVC's VHD player uses grooveless plastic discs with one hour of TV pictures (plus optional stereo sound) on each side. A metal-tipped sapphire stylus helps to sense capacitance changes created by microscopic pits on the smooth surface. The stylus "reads" both video and audio information and tracking signals, used for electronic stylus guidance. The player has still-frame, slow, fast, and reverse motion. Add an optional demodulator (right, in photo) and the system plays PCM-encoded audio discs with a 90-db dynamic range and flat audio bandwidth from one Hz to 20 KHz. A random-access option with a wireless remote control (left) provides microprocessor-programmed or on-the-spot selection of TV pictures or audio bands. While JVC and other with mechanical-contact video/audio disc systems await format standardization before marketing thier machines, other firms with non-contact optical-disc systems aren't waiting. As you read this, Magnavox may be test-marketing the long-promised Philips/MCA videodisc player (PS, Feb. '77) in a few cities. In addition, U.S. Pioneer Electronics says it will market another laser-based optical videodisc player sometime in 1979. This machine was jointly developed by MCA and Pioneer in Japan. MCA's discs (some 200 initial titles) will be compatible with both videodisc players. Technically, with a plug-in demodulator, the Philips/MCA videodisc machine could also be adapted to play PCM audio discs. But Philips plans to offer a seperate optical player for digital audio discs in a few years. Philips' audio discs are only 4.3 inches in diameter and the player is a compact seven by nine by three inches. Discs play one hour. JVC's latest player differs from the hardware shown in Japan last year primarily in the method of loading discs. Instead of loading discs on the turntable like a conventional record player, you now slide a heavy plastic sleeve holding a disc into the machine. The disc is automatically loaded on the turntable when the sleeve is withdrawn, and removed when the disc jacket is reinserted. This prevents smudging of the smooth-surface, grooveless disc, which, unlike some mechanical systems, can provide features like random access and still frame (available on Magnavision players). 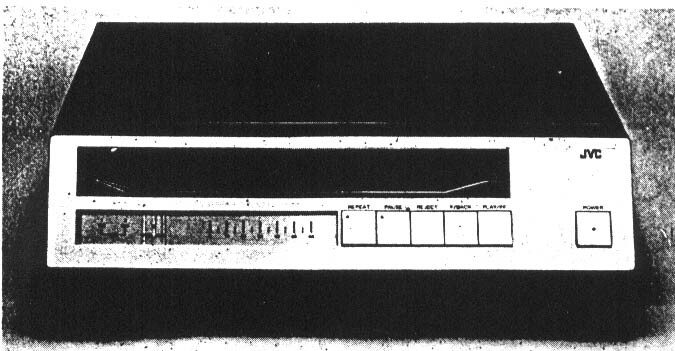 RCA modified its similar video disc player for automatic loading after home tests showed smudging from handling was a serious problem. RCA's video-only system, however, has been based on discs with grooves, making the two systems incompatible. JVC, RCA, and other firms developing mechanical-type videodisc systems have been conducting talks, though, trying to establish a compatible standard. RCA has been buying software and gearing up for marketing its system, perhaps in 1980. Notes: AHD was adopted, along with the Philips/Sony CD standard, as the "official" digital audio disc standard by the Digital Audio Disc Committee. No other systems were accepted. Note that in the first article, the discs are 12-inches in diameter. The sapphire stylus was changed to diamond after tests showed both JVC and RCA that sapphire was too fragile. While RCA and JVC tried to establish a compatible standard, RCA really didn't want to - because of licensing revenues, they wanted JVC to adopt the CED system intact.